Many people who embark on professional cooking careers, or just interested in having an experience in a French kitchen, are interested in coming to France to do an internship, called a stage. “Unfortunately, the days of students coming over for the summer and walking into a position are long over. The rules governing stages are now quite strict and all stage require a work contract (convention de stage) of many pages signed by the employer and intern and school and approved and filed with the local prefecture. Inspectors come by regularly to investigate the conditions and whether they reflect the contracted agreement. Interns working over 2 months are also paid about $500 per month. Students registered in a recognized program may only work for 6 months at a time or for a total of 1 year as interns. These terms are the same for French, EU or internationals. Stages are built into the French education curriculum so its often difficult to place Americans who can only work in the summer. If you can work longer you can apply for a long stay visitor visa once you have an approved contract. If you’re an American student currently registered and under 27 years old you are eligible to apply through your school if you can find someone to sponsor you. Of course there is the additional cost of housing and travel but some larger hotels have intern housing. Be aware that there are a limited number of slots and if you don’t speak French they might not accept you unless the Chef speaks English. As you can see, there is no one right or wrong way to get an internship in a French bakery or restaurant. I was recently having coffee with a well-respected chocolatier and I asked him how he hired interns. He gave me about fourteen responses, none of them explaining anyone particularly concrete method. The conclusion was that it just depends on the situation and the whims of the proprietor. One certainly need persistence, being in the right place at the right time, or getting help from a school or professional organization. And while not absolutely required, you should have some professional experience under your belt before inquiring about an internship. If you’re interested in becoming a stagiaire in France, here are some tips and advice. The first thing to do, of course, is to identify the kind of place you want to work in. A butcher shop, a restaurant, cheese shop, a bakery, or another kind of business. Most people, however, seek work in a restaurant or bakery. Once you know what to focus on, do some research to learn more about that business or various places you want to target. The internet is the easiest place to start and you can search and see if those places, or others, take interns reading from the experience of others. Some of the culinary bulletin boards, such as EGullet, Mouthfuls, and Chowhound, especially in the France forums, are good places to look. This is the second step. In spite of the ease of e-mail communications, most places in France usually prefer receiving a traditional letter, which is likelier to get a response. You can mail or fax it. If you’re planning on going in, in person, it still is a good idea to have a cover letter to your resumé, otherwise known as your CV (curriculum vitae). Write a concise cover letter, and get to the point right away. This is called a lettre de motivation. It should be no longer than one page. Explain who you are, your experience, and why you want to do an internship in their establishment. There’s no need to tell your life story, just say what’s applicable and get to the point quickly. It’s also important to write the letter in French obviously. Avoid online translating tools, which make errors and hire someone who speaks French. You can find translators and students on bulletin boards and online at places like Craigslist and sites that provide translation services. You do not need a certified translator, but plan on paying about $20-$40 per page. Should you decide to write it yourself, remember that the French use a lot of salutations when letter-writing and they judge applicants not just on how well letters are written, but the applicants handwriting (if you write it by hand), and if the correct salutations are used. Often with a French CV, which we call aresumé (they don’t use that term and you shouldn’t either), a current photo is included. It’s not necessary, but you may want to include one if you’re seeking work in the service industry. French identification photos should be a straight-on head shot, and you should not be smiling. Do not write a generic letter and send it to a bunch of places; personalize each one. Include your contact information; your address, e-mail address, and fax number. Attach your CV. Mention your availability—being flexible is best, and explain your knowledge of the French language. You do not need to speak fluent French but it’s good to let them know your level of comprehension. If you don’t speak French, I strongly recommend taking some French classes or a French language intensive if you want to get the most out of your experience. Restaurants and bakers are hectic, and people work at a crazy pace. Most professional kitchens are tough places, and newcomers are not always made to feel welcome. After having spent thirty-five years working in professional kitchens, the onus is on you to prove yourself. Newcomers and interns can expect to be filling flour bins, lifting dough, emptying the trash, and spending hours peeling the skins off walnuts or cutting mounds of butter into perfect little squares in very fine establishments. You may encounter xenophobia and sexism, both of which are still alive in professional kitchens around the world so having a tough shell is important. Expect anything, including working long hours: in France, the staff in three-star restaurants often work both the lunch and the dinner shifts every day. Some of the more popular and famous places are now charging for the privilege of working there. 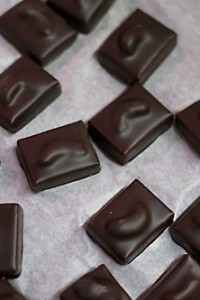 When I was writing my chocolate book, I inquired with a well-known chocolate maker in France about working there for a week so I could feature them in my book. Their response was that I was welcome to come—for €500. Because of the strong demand to work in French establishments, some have so many applicants that they will request a fee from interns to cover the costs, which often include administration and helping you find housing and a visa if it’s a particularly large establishment. Also if you intern at a well-known place, you can include that in your resumé, and in some cases, you might get hired. In any case, it may be a worthwhile investment. So don’t be surprised if you’re asked to pay a fee, especially in Michelin-starred places, although it’s not all that common elsewhere. It is considered a great honor to work in certain places, most notably the kitchens of grand restaurants (such as a 3-star establishment.) And as valuable as you think you might be to such a place, they have a long line of people waiting to get in the door. Plus they have a dining room full of guests to please, so come in humbly, and be open to learning. Chefs, head bakers, and pastry chefs in France are accorded with more respect than you might imagine. If one is wearing the red, white and blue striped collar, she or he is an MOF, which means they’re passed an extremely rigorously test to achieve that. Whoever you work for, if they tell you to do something, you do it without asking why. In France, there’s a long-established system of apprentisage where you always respond, “Oui, chef” to any requests made of you. For those not used to being in that kind of position, and in that kind of relationship, with a chef, realize that in France, head chefs, pastry chefs, and bakers command a lot of respect from their staff, which is usually well-earned. Always speak to people who are your superiors with respect. The top culinary schools in France have relationships with various restaurants and pastry shops, and place students in internships. 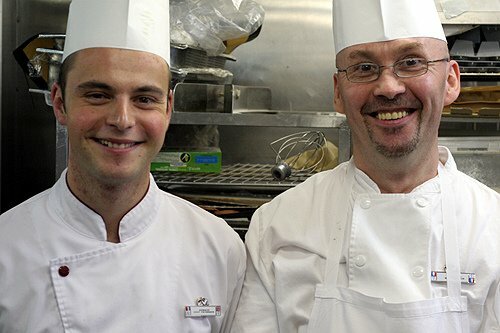 Schools in Paris include Ecole Ferrandi, Cordon Bleu, and Ritz Escoffier, and Ecole Lenôtre. Some of these schools offer courses in various languages, others only in French. If you attend the schools, they will help you get an internship. Current rules in France, for Americans, allow you to stay here 90 days without a visa. After that, you should have a visa. It’s a rather complicated, and confounding process (Ressortissants étrangers), which some people avoid. Foreign students may get help from their school, but you should inquire with your local consulate about requirements if you wish to stay in the country longer than those 90 days. Be prepared for a variety of answers, if you get one, not all of which may be correct. The various websites of the French consulates in the United States have conflicting information, which is one of the quirks of the system. Certain French establishments will not take on interns from non-EU countries because of laws requiring working papers and health insurance. However a new initiative in France provides possible visa assistance for stays of 18 months for training in France. You may want to come to France and inquire in person about working in a shop. As mentioned, often chefs are quite busy and don’t have time to read their mail. Making an appointment and showing up to meet and inquire is another strategy you might consider. A personal appearance shows a commitment and gives them a chance to size you up as well. The French enjoy meeting in person, but a face-to-face meeting also gives them a better opportunity to gauge your level of interest first-hand. It also gives you an opportunity to check out the kitchen and see if the place is right for you as well. If you aren’t able to get an internship in France, consider another country. There are great restaurants in Belgium, Spain, Italy, Japan, Canada, the United States and elsewhere. Although I’ve personally had wonderful learning experiences in France, there are great chefs, restaurants, and bakeries in your home country. This is a great resource, David. Thanks so much for posting it!! When my dad was sick and I was stuck in rural PA taking care of him, my dream of cooking in France kept me going. Now that he’s gone, life is back to “normal” but hopefully one day I’ll make my dream happen. Les doigts croises! Potters in our pottery village have much the same requests. There are potentially about 60 ateliers to choose from here. However, we have found that A) stagiaires want to be paid while they are learning, even though they can’t contribute much more than muscle B) amateurs who want to be taught from scratch are amazed that we ask a fee (a very low one at that). Receiving people in a busy workshop with serious schedules requires a sacrifice on the part of the potter (or whatever discipline), although it’s fun to spend leisure time with enthusiastic young people from all over the world, have lovely meals with them and so on. That’s our reward I suppose. You, David, must have heaps of requests from people who want to experience some of that expertise and wit! And I meant to ask HOW do you manage to achieve all that you do AND keep up this blog on a regular basis? It’s so good to know there’ll be a post several times a week. So thank you. this is exactly what i did while i was an assitant in france. i wrote a lettre de motivation, a french cv, and actually attached some photos as well. i wasn’t paid – nor did i ask to – but what i learned and tasted in the back of that french kitchen, plus all the new friends i made, made it much much more valuable. When I was at Lenôtre, I didn’t speak much French and because I missed some of the information presented because of that, on the last day of class, the chef/instructor grabbed my hand and gave me a two-hour personal tour of the factory and we tasted everything. Of course, I was honored. But he saw that I was truly interested in what they were doing and was happy to do something extra because of that. Either way, it takes additional time and energy to show ’em the ropes, which is part of the handing down of knowledge, but you need to make sure that who is coming into your kitchen will appreciate it. So I guess that’s why places are now asking for fees and such. I am a huge fan of your site and you have invaluable resources! I can’t mention the amount of times stagiers have came into the restaurants I’ve worked in who complain and don’t appreciate or understand what they’re doing there. Great “How To” – I am planning on attending the short 6 week course at the Institut Paul Bocuse next summer. Do you know anything about Lyon? The word is it out strips Paris… probably just “Horses for courses”… literally. That’s one of the things that endears me to the French. That astounds me. I can see charging an unknown, relative newcomer, but you’re a noted chef and author. That’s akin to asking Sting to pay for the privilege of being the opening act for Elton John. Great information David. Wish I could swing a stage in France, maybe later. I’ve got to get through my apprenticeship in Berkeley first. good stuff…food for thought for sure. thank u! Will: One of the curious things is that when you’re writing a book, no one will talk to you until you show them a book you’ve written on the subject..then they’re happy to help you out. They likely have folks coming through with the same request, although mine was genuine. This is a fantastic and informative post David. I am thinking of attending Cordon Bleu in Sydney Australia next year but am looking forward to 5 weeks in the south of France in September. Thank you for this. I wish I’d had a primer half as concise for my internship last year! I did a stage at a restaurant in Marseille last summer by researching interesting looking establishments and chefs and then emailing them. As an American culinary student, one thing that was necessary was a “convention de stage,” a document between my school and the restaurant stating that I was indeed a student and would not be expecting that the stage would become employment and the length of time I was allowed to be legally working in the restaurant. I will be returning to France in September, this time to Burgundy for a wine stage during harvest time and will need to have another convention de stage exchanged between my host and my school. Thank you so much for writing this post! I am the office manager of a medium-sized, high-volume bakery in the States, and just today I had yet another starry-eyed culinary school graduate asking to work for us for free for six weeks. I try to explain myself very clearly, but somehow they never seem to understand (or accept) that our production is not of the sort where we can accommodate that. So I heartily second your tips to do research, have professional experience behind you, and be humble. I would even add that I would never consider an internship request without a serious time commitment, or a commitment to employment after the internship were over. A few years ago this would have been enormously helpful to me, I attended Ecole Ferrandi 2003-2004, I loved the program and have been working in yachting as a chef since and loving it. I choose not to do an internship in France but certainly could have. One of those life regrets but I had to deal with some problems at home. Your missives strike true chords for me and make me miss France in spite of, or maybe because of all the differences between the French and US. It was one of the hardest times in my life. living in a city, using public transportation, not speaking the language (tete bois). On the other hand having survived and grown form the experience I realize I can do anything. Thanks so much David you always brighten my day. These tips are great for anyone looking to stage in France. I just finished a 3-month stage at a charming bistro near the Pasteur metro station. My wife and I will only be in France for another month or so, but when we first came here in February, I thought finding an internship would be extremely difficult (as painful as getting the visa was!). Luckily, I was trained at a french culinary school in the US, and those contacts proved to be invaluable. I’m currently trying to arrange a shorter stage at either a butcher or a restaurant that specializes in offal…that kind of training is hard to come by back home! Thanks for so many great posts. Keep them coming!!! David, Who are the intern and chef in the picture? Great photo! Great post as always, David. To respond to Justin about Lyon – I did the stagiaire at Paul Bocuse Institut two years ago and it was a first class experience with great chefs who were passionate about imparting their knowledge. The Institut is a state of the art centre – you won’t be disappointed. However, the student residence “Le Clipper” is pretty crummy. I felt like I was in a prison barrack. The foie gras lunches helped somewhat. Lyon is certainly a gastronomic centre, and is different from Paris culture and why compare them? Each has it’s own identity.Try to eat at as many bouchons as possible in Lyon to appreciate their regional cuisine. Thank you so much, David. This is very helpful. 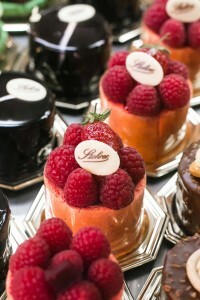 Interesting post–would be great to apprentice or do an internship with a baker, pastry chef, or restaurant in France!! I was surprised to find when I did some training here–at a school I shall not name due to some mixed experiences!–that I love bread baking. 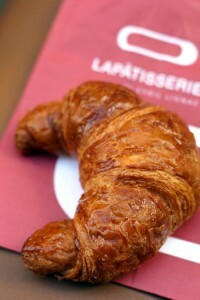 I also enjoy the viennoiserie, baking cakes & pastries–but the whole process of bread baking drew me in. I arranged my stage, by sending cover letters to about 2 dozen restaurants, A french friend wrote the letter for me. I asked for 2 months. The one I went with provided room and board. It was a great learning experience, and so much fun going out with everyone at night and our day off. The highlight of my 20+ years in pastry. I sent my letters out shortly before I went, Some of my choices were only available for later in the year. In a few weeks I will be doing a 6-month stage (all expenses paid) in San Sebastian, Spain. Okay, not France, but Basque country is close! The program details are here: http://basquestage.com/. I thought your readers may be interested in applying for the second round, slated for the latter half of this year. Merci and hope to see you in Paris again!